Our trade of the week features a UK based digital solutions business, supporting companies around the world. A GBP invoice was raised to a MENA Telecoms PLC was traded in the local currency within 24 hours of approval. This week our trade of the week features an SME customer on the cutting edge of digital solutions and strategy, supporting companies around the world. With a focus on APIs, their solutions are in high demand. 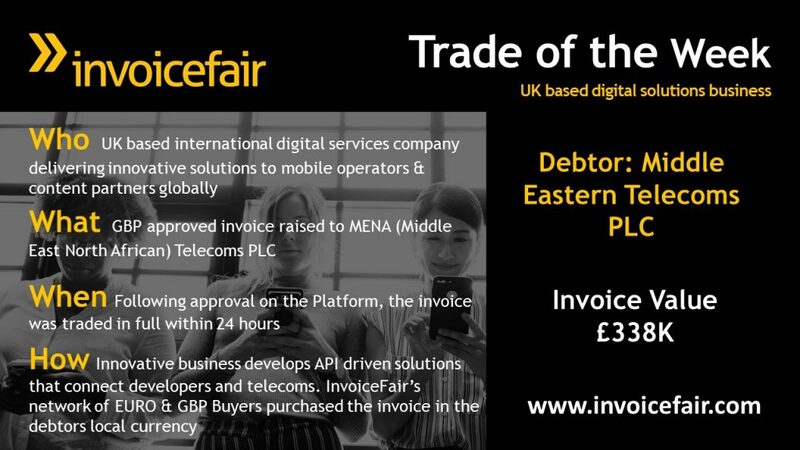 For this trade, a GBP invoice was raised to a MENA (Middle East North African) Telecoms PLC. This invoice was traded in the local currency within 24 hours of approval on the InvoiceFair Platform, purchased by EURO and GBP Buyers. Many of InvoiceFair’s customers are highly innovative and working in the rapidly evolving digital space. They are driving technical innovation for businesses across the world. In our daily auction we trade future receivables for established SMEs across all sectors in Ireland & the UK. If you would like to discuss how we can partner to scale your business, contact Sorcha Mulligan at Sorcha@invoicefair.com or call +3531663662.